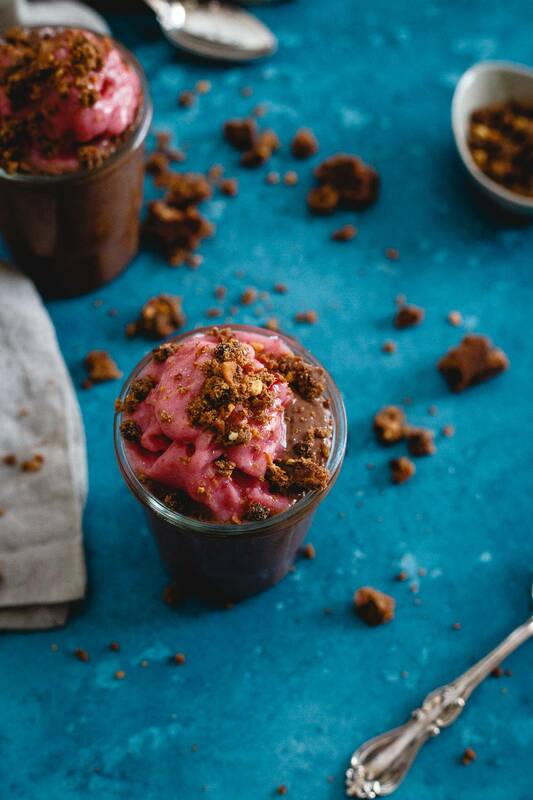 This peanut butter chocolate chia pudding is a healthy dessert parfait topped with whipped frozen strawberries and peanut butter chocolate chip LÄRABAR crumbles. I’ve gone through a lot of “phases” when it comes to food since what I like to call my “healthy food epiphany” back in 2009 (you can read more about that journey on my about page). I dabbled in paleo for a bit, while undocumented on this site, I played around with a more vegetarian approach (no idea what I was thinking with that one, I love meat!) and now most recently, I’ve been using a macro-nutrient approach to my diet for over the past year. This post is sponsored by LÄRABAR. There’s been one constant underlying theme to all those approaches though and it’s something I’m pretty unwavering about in importance. I still credit Michael Pollan’s In Defense of Food for this little nugget that has stuck with me but quality foods and simple ingredients have been paramount no matter what “diet” approach I’ve taken. In fact, in the macro-nutrient world I sort of live in now, I’m probably in the minority with this one. Everyone’s all “IIFYM” (if it fits your macros) and throwing up pictures of the Pop-Tarts and other junk they make work in their diet while I’m over here like, I’d rather eat an entire sheet pan worth of vegetables and feel full than the half a Pop-Tart or other junk food I’d get for the same amount of carbs. I remember first hearing about these magical little things called chia seeds pretty early on in my weight loss journey. People were throwing them in smoothies, in their bowl of morning oats and then making something called pudding with them too! I was skeptical but considering I loved tapioca and texture issues weren’t usually a problem for me, I gave it a shot (this blueberry coconut chia pudding was one of my first tries actually) and subsequently fell in love. Chia pudding became a real food staple in my diet ever since when I’m craving dessert or a sweeter snack but want to keep things healthy. From seasonal ones like this pumpkin pie chia pudding or this pumpkin chocolate chia pudding in the fall to this gorgeous spring/summer layered strawberry guava chia pudding you can pretty much assume I whip up a batch at least once a month to have on hand (it keeps really well in the fridge!). LÄRABAR, like chia pudding, holds a special place in my healthy food journey as well. Chalk it up to seeing the bars on every single healthy food blogger’s site I read even before starting my own, their bars, with their simple ingredients and real food approach got me through many a long runs back in my running days and made it through every “diet” phase with me (many of them are Whole30, paleo and vegan compliant). They were pretty much a given to be found in the bottom of my bag (or food satchel as my coworkers used to call it) no matter where I went to make sure I always had a healthy snack at my disposal. They were also a welcome real food departure from previous protein bars (which shall remain nameless for the sake of the guilty) that I used to consume. When I thought about how to feature LÄRABAR and their 25% off promotion, it just made sense to combine the two in this peanut butter chocolate chia pudding. 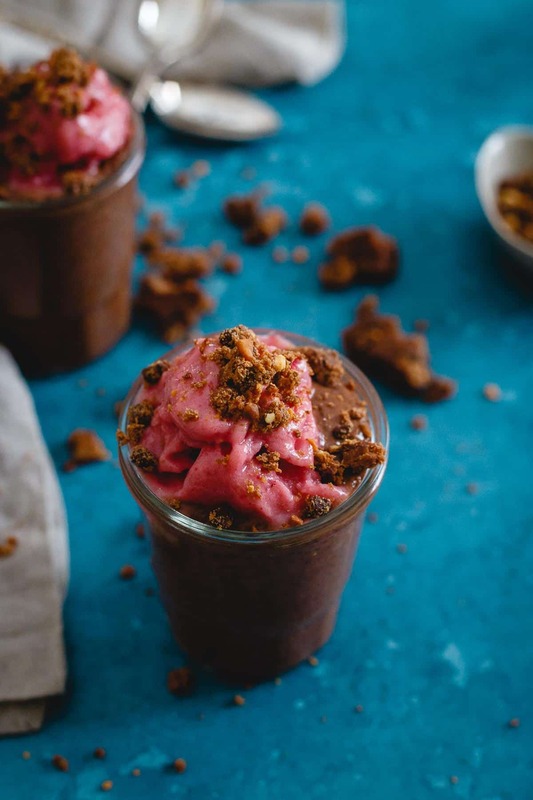 It’s no average chia pudding either, with a whipped frozen strawberry topping and peanut butter chocolate chip LÄRABAR crumbles it’s a simple, real food, healthy dessert disguised as a decadent indulgence. 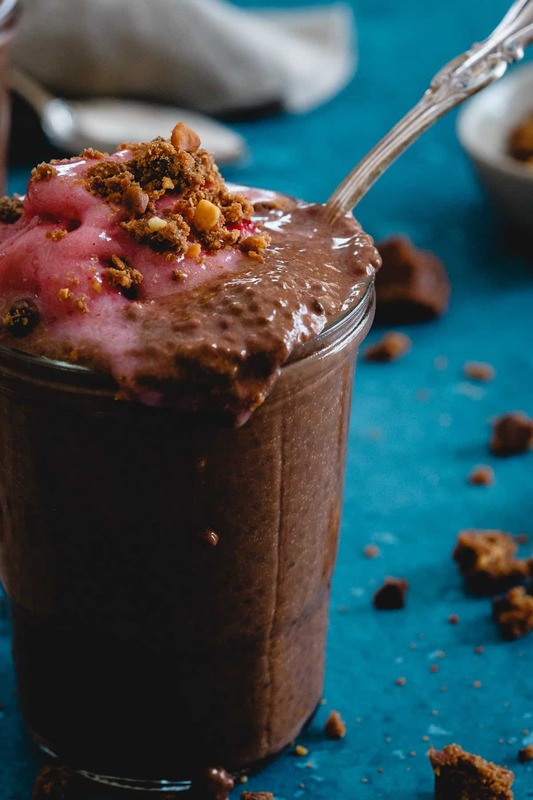 Unsweetened cacao powder and powdered peanut butter (<– new recent fave) make the pudding itself taste like a peanut butter cup while the whipped frozen strawberries add a fun icy natural sweetness. 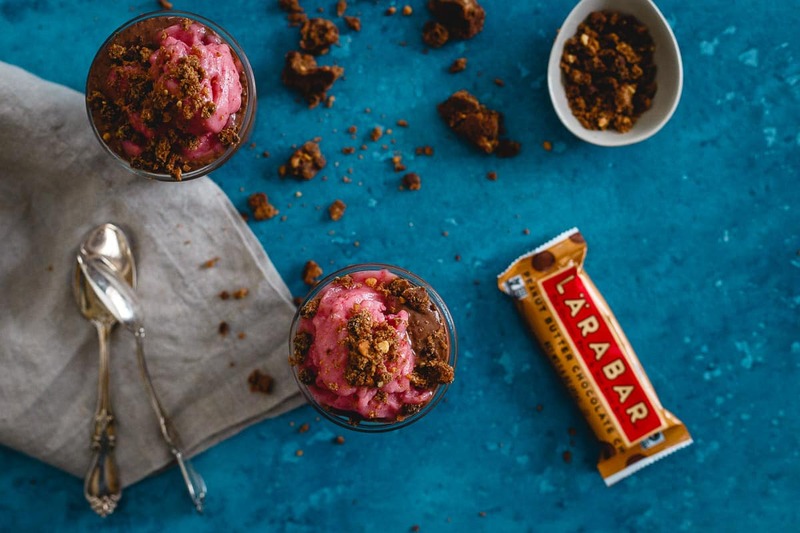 The LÄRABAR crumbles are just the icing on the cake with any bite that includes a piece making your mouth all sorts of happy. 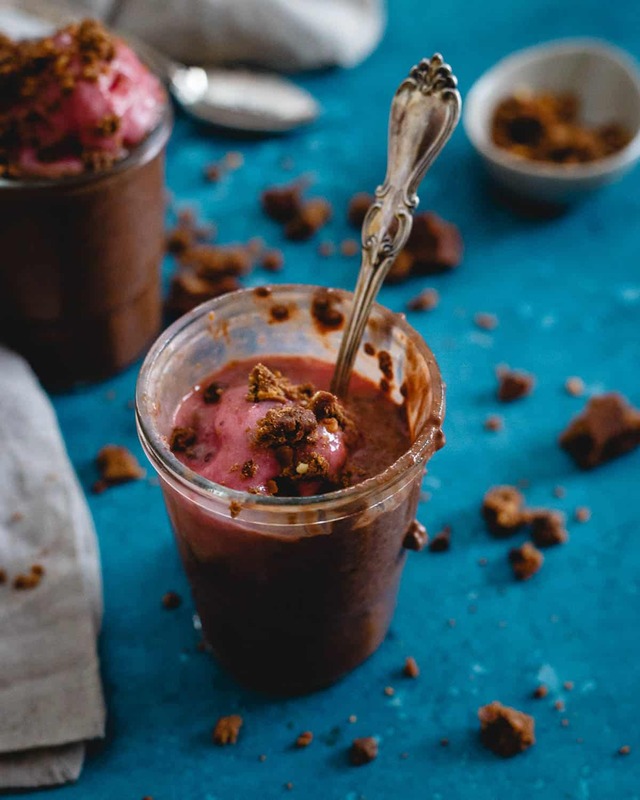 This peanut butter chocolate chia pudding is a healthy dessert parfait topped with whipped frozen strawberries and peanut butter chocolate chip crumbles. Combine all ingredients for the pudding in a large bowl. Whisk together until thoroughly mixed. Cover with plastic wrap and refrigerate for at least 2 hours until thickened (this can be done overnight as well). Before use, stir the pudding well to break up any clumps that have formed. Place the strawberries and banana in a food processor. Process and slowly stream in the milk. Scrape down sides as needed and continue processing until smooth. You may need more or less milk to achieve desired consistency. Start with less and add as you go. Evenly spoon chia pudding into 4 jars. Top with the frozen whipped strawberry mixture. Crumble the LARABAR into small pieces and sprinkle on top of each jar. Chia pudding can be made in advance and kept refrigerated. Frozen whipped strawberry topping should be made right before serving. Whoa that looks good. I have tried so many of the bars, but for some reason, never a Larabar. I need to remedy that. Just wrote “Larabar” on my grocery list! Gosh I love that you make desserts I would actually eat!!!!! These look awesome. I love LARABAR plain but I cannot imagine how amazing one would be in a recipe like this! Lara Bars are the BEST! This dessert is freaking amazing!! This is a dessert that literally everyone here would love! I totally agree Gina. This is no average chia pudding! Wish I could grab a spoonful off my screen! This looks not only pretty, but also super delicious! I love chia pudding!!! and crumbling the LARABAR and sprinkling on top is genius! LOVE! Larabars are SUCH a great snack…and using them in chia pudding?! YOU ARE GENIUS! Ooooo this looks so good! The peanut butter chocolate chip bar is my favorite larabar flavor and looks like it pairs wonderfully with this recipe. Amen to focusing on eating real food! I’m training for a Spartan race in the fall, so I’m reallllllly trying to get my behind in gear and eating more wholesome foods! Love the chia pudding! LARABAR’s are the best!! Honestly, this sounds so good! This is absolute perfection. I could eat this all day long. Think there is a way to substitute peanut butter for the powder? Yes, you could definitely add creamy peanut butter to the mixture instead if you’d like. I chose the powder for the flavor but not as much of the fat.